My nationwide tour of Rose in Thorns has picked up from where I left it in July, and is about to arrive in Wellington. I am in Palmerston North right now, and will be heading down to Wellington tomorrow. This is so I can be at my very first Wellington Craft 2.0. 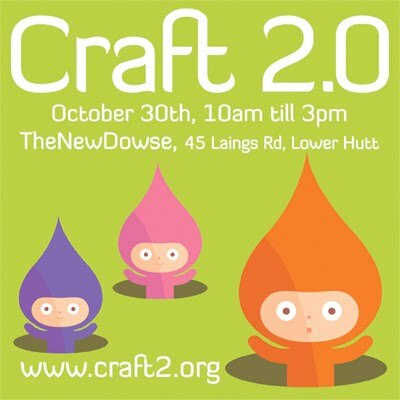 I am very excited to be at the home of Craft 2.0, after attending and selling at the Christchurch events. I will be joined by Emma from Freedon Creative, Lucy from Felt, and Mel from Black Swan Designs who are also coming up from Christchurch. Craft 2.0 is New Zealand's biggest contemporary craft event, and features some great talent from Wellington and beyond. If you're in Wellington, it's well worth the trip to The New Dowse in Lower Hutt. It has expanded upstairs this time, so will be the biggest Craft 2.o ever! There will be a crafting space where you get to make things, a huge prize draw, and free entry too. It's on from 10am - 3pm. If you come along, do say hi, it's always nice to meet readers of my blog! I am looking forward to your stall, you combine my love of teacups with crafting. I will certainly come by and say hi. Good luck Rose - hope it goes really well. I have yet to make the jump across the ditch but may give it a go next year. Thanks angelgurl! That was my favourite cup of the ones I brought, so I thought it would sell, but didn't expect it to go so quickly! I hope you get lots of enjoyment out of it.